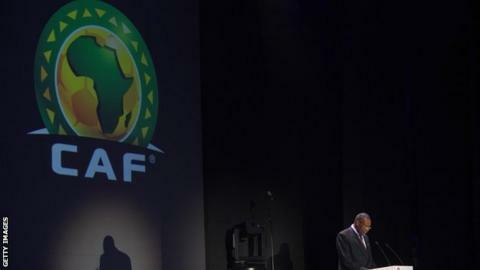 The Confederation of African Football (Caf) has rejected an appeal by Rwanda against their disqualification from the 2015 Africa Cup of Nations. Rwanda's failure means Congo Brazzaville will compete in Group A of qualifying, alongside defending champions Nigeria, South Africa and Sudan. Rwanda were expelled after beating Congo in the second round, as the latter argued Dady Birori had been ineligible to play in the tie. The player has both Rwanda and DR Congo passports, both of which bear different names and different dates of birth. "Any team that has committed fraud on the identity of a player ... will lose the match and shall be eliminated from the competition," said Caf in a statement. The decision was taken after Caf's Appeals Board met on 27 August to address Rwanda's appeal against their disqualification earlier this month. "It was established that the player Dady Birori, playing with the national team of Rwanda, was the same that played in the Champions League with the club AS Vita using the name Etekiama Agiti Tady," added Caf. Caf's investigations found that the date of birth for the DR Congo-born striker on his Rwandan passport is 12 December 1986, while his Congolese passport indicates that he was born on 13 December 1990. "Based on the documents on record, it was evident that the Rwandan federation was aware of this double identity but proceeded to feature the player for the national team while he held a different identity with the club," said Caf. Members of the Rwandan FA are now considering a possible appeal at the Court of Arbitration for Sport, which is sport's highest legal body. "We have received communication from Caf indicating that our appeal was not successful," Bonnie Mugabe, the Rwandan FA's Media and Communication Officer, told BBC Sport. "Our officials and lawyers are now analyzing the long letter to see the way forward." Libya, who Rwanda beaten in the first round of qualifying, had previously lodged a claim against the striker but their protest had failed. The group phase of Nations Cup qualifying gets underway on Friday 5 September, with Congo playing in Nigeria a day later.